I took Thursday and Friday off work using Thursday to get everything packed and ready. Even still we did not get away as early on Friday as we'd hoped, leaving Ottawa just shy of 11 am. After a detour into Pembroke we rolled into the Sand Lake Gate around 2:20 pm to check in. By 3:40 we were loaded on the shore of Grand Lake at Achray ready to shove off. Since we had no experience on Stratton and since Algonquin does not allow you to book specific campsites (you can only book "a site on lake X"), I was starting to get a bit worried about racing against sundown. We really did want to be on the water a lot earlier than this. Fortunately one of the park wardens strolled by and I asked him about sundown since I'd forgotten to check before leaving, and Achray is a good 40km beyond the closest cell reception. He told me it starts to get dark around 7:30 and by 8:00 it was pretty dark. I was encouraged by that news and figured we should not have any troubles finding a site and getting set up before sundown. 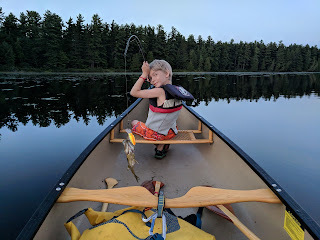 Only moments after launching with my wife in the stern of her canoe and our teenager in the bow, our 1 year old became frantic and began howling like a banshee. 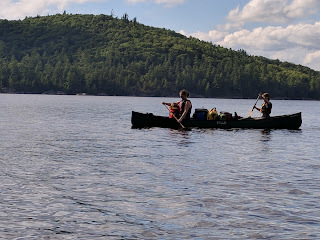 With fears that our trip would be cut short we started to brainstorm ideas and the most obvious one came to us first - since both teenagers had lots of canoeing experience the plan was to get back to the dock and put him in the stern and my wife in the bow with the toddler. If need be our son could solo paddle while my wife dealt with the toddler. It only took a few minutes to accomplish the switch, and we set off across Grand Lake on a bee line towards the mouth of the river leading to Stratton. And sure enough it did not take long for the toddler to start howling again - but this time we were prepared! With our son at the stern, my wife very quickly figured out how to nurse while paddling in the bow, with the toddler standing up facing her. We made it half way across Grand Lake like this, with the toddler eventually falling asleep standing up. 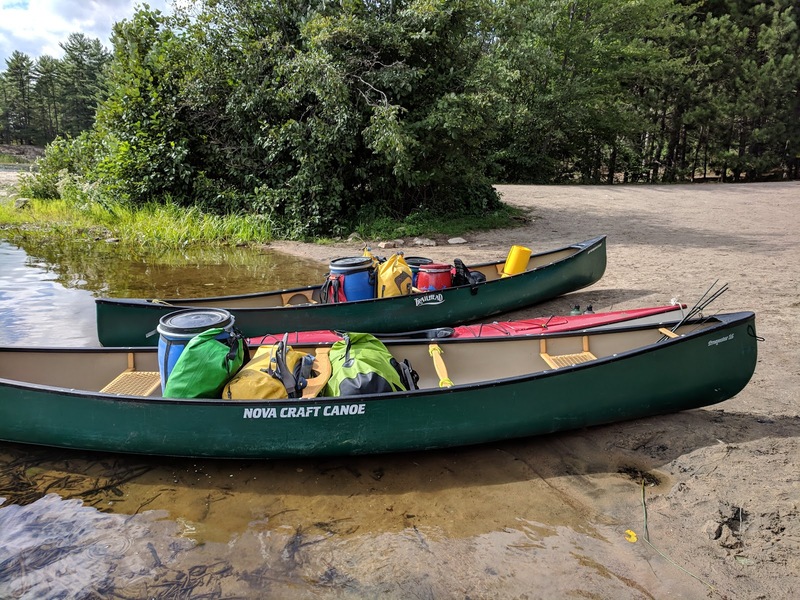 We made our way into the mouth of the river and around the couple of short bends leading up to the portage at the dam, and it then took us about 30 minutes to portage our gear and canoes the short 30 meters beyond the dam. The canoes we almost fully unloaded and took the gear first, then came back and carried the canoes right-side up by the bow and stern handles - on such a short portage this worked well. We had a fair bit of gear stashed in the storage compartments of the kayak, but it was still light enough that we were able to carry it across without unloading it. On a longer portage that may not have been possible. Away we went beyond the portage, and started towards the left side of Stratton Lake since that's where all the campsites are. 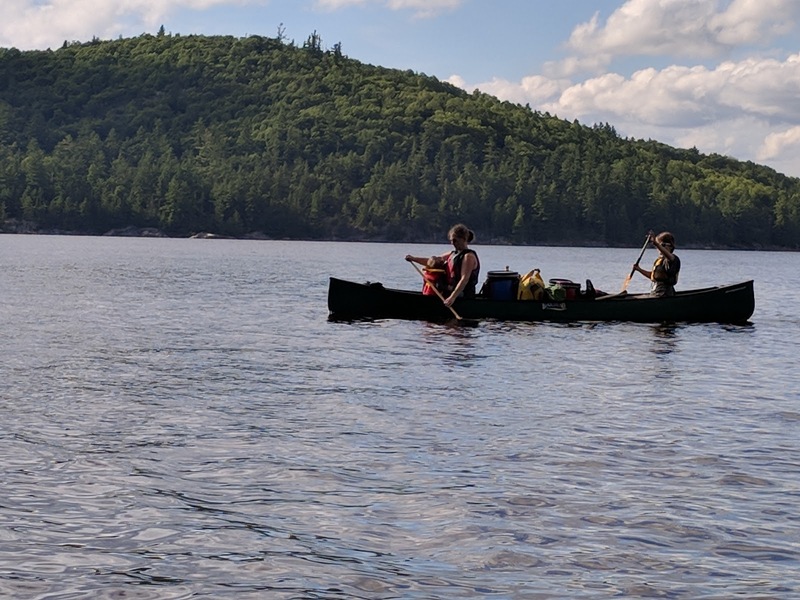 Our original plan was to use walkie-talkies and make our way up the lake with one canoe staying on a free site to hold it in case someone else came along, while another canoe went up the lake looking for a better site. But the first site was free, and given all the issues we'd had with the toddler we decided to take it since it was a very large and well maintained site. And we would later agree that this was the right decision in any case since it made for a much shorter trip getting out on Monday. Around 5pm we were unloading gear and getting our tents set up. 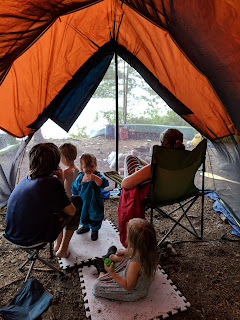 My wife and the toddler were staying in a MEC Wanderer 4 that I'd picked up off kijiji a few years ago in nearly-new condition, and I was staying in a Sierra Designs Zeta 4 with the 3 and 8 year olds. I got that one at Sail half price about 5 or 6 years ago. I have a video review of it in my video links below. The teenagers were using our two Hennessey Asym Side-Zip hammocks. I got them both off kijiji at separate times - $100 each. One was barely used and the other was actually new in the bag never before used. Yes I'm a kijiji junkie! With the tents all erected we started getting the kitchen set up around the fire pit, to cook our supper of hamburgers. 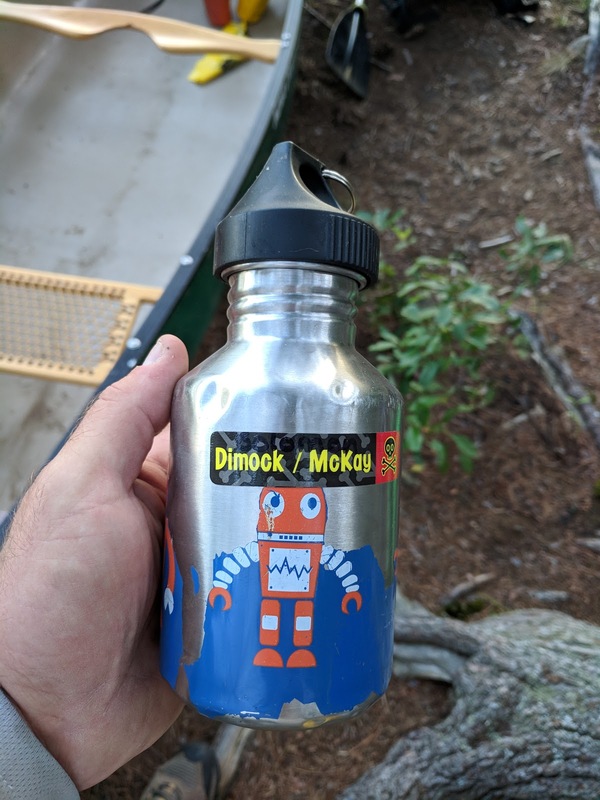 I also made sure to ascertain the location of my whisky, which I had put into one of the kids stainless steel water bottles since you are not supposed to have single-use beverage containers in the backwoods campsites. We were eating the first burgers around when it was getting dark just shy of 8pm. Of course the teenagers wanted a second burger but they are well versed in camp cooking so they took care of that on their own while the rest of us relaxed. I found a spot just outside our site for dish washing and grey water, and when the cooking was done I cleaned up all the dishes. It was probably around 10pm when we all went to bed. There was some light rain overnight but by the time we woke in the morning it was over and the sky was clear as a bell. It did get chilly overnight though - dropping to about 16C which required me to get inside my sleeping bag and zip it up. 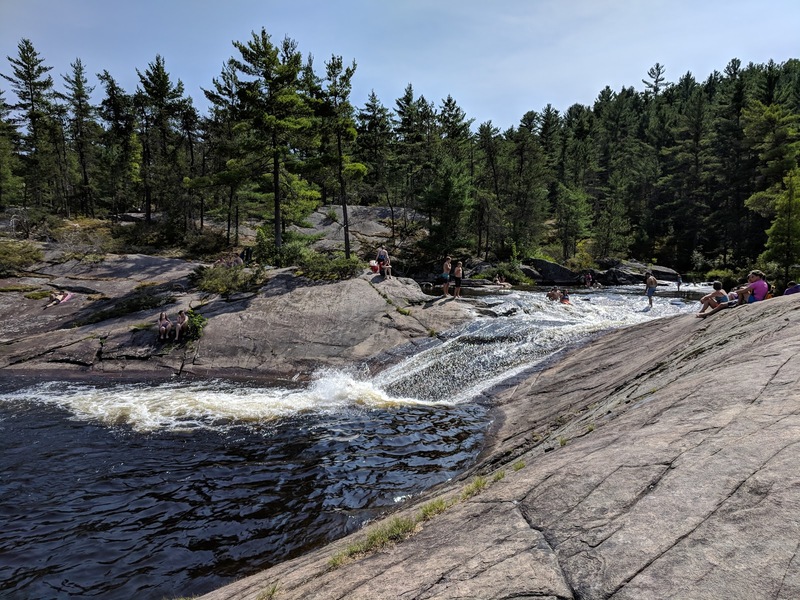 We knew that the forecast said today would be the best day for weather and that it might be raining on other days, so we made plans for a day trip to High Falls. Our breakfast was a long slow one involving bacon, hash, eggs and oatmeal, and it lingered into lunch time. Shortly after lunch we were setting off for high falls, and decided as part of that to take our food barrels with us for two main reasons - (1) in case a bear should wonder into our site when we were not there, and (2) for ballast in the canoes. At first the toddler was enjoying the ride, but about half way to High Falls she became frantic again, which allowed my wife to get some more practice at nursing while paddling. This time since we were not loaded with gear we only took the two canoes, with an adult and teenager in each one, and the younger kids distributed between them. It took us about an hour and twenty minutes to get to the end of Stratton Lake, where we pulled up our canoes in a sea of other watercraft. It was a beautiful sunny day and it looked like High Falls was going to be extremely busy. We had no idea how to find the waterslide but after asking a few people we got directions to just keep following the path to the left and it would lead us there. We all walked except for the toddler who rode in a baby carrier on my wife's back - and in hindsight my wife said that had she know what type of terrain was involved she would have stayed behind. It was a pretty rocky path with lots of ups and downs, and a bit of bouldering in a couple of places. It took us about 10 minutes to get to the falls - but wow once we were there it is truly an amazing spot even if it was packed. There had to be 50 or 60 people scattered all over the rocks in an extremely wide area. We came up over a bluff to get a spectacular view onto the falls, which had a stready stream of people sliding down it. I especially enjoyed High Falls because it is the type of place that I grew up swimming in. I am from Nova Scotia and I spent most of my summers as a teenager biking out to Park Falls with friends. It is a smaller area but also had a waterslide waterfall that we used to enjoy. We stayed for about an hour during which I and all 3 boys got to enjoy the waterslide - though the 8 year old only went down once because it was a bit scary for him. But he was still proud of the fact that he went down. We made our way back to the canoes and had a leisurely lunch standing next to them before we shoved off and headed back to our campsite. It again took us about an hour and twenty minutes to get back, and linked is a map created from the GPS track I took of the trip. It was about 5.3 km each way. We were back at our campsite shortly after 4pm and it was not until closer to 7pm that we started to prepare our supper. Supper on day 2 was a stir fry involving mixed vegetables and 3 cans of chicken from Costco. My wife was determined to turn those otherwise flavourless cans of chicken into something really yummy, and she did manage to accomplish that with the help of 3 pouches of VH Sweet and Sour Sauce. We'd brought instant rice to minimize fuel consumption, and by about 7:30 we were scoffing down a really yummy meal that everyone enjoyed. There was a small amount left over and after discussion on what to do with it we decided to burn it in the camp fire that we started after supper. After supper we were all keen to get to bed, being a bit tired from the trip to High Falls. Overnight on night 2 it stayed warm in the 22C range, so I was able to just sleep on top of my sleeping bag. Breakfast was once again bacon and hash just like the day before, and once again we saved the bacon fat in a small pot in case we needed it later in the day. There was no rain overnight but it was extremely foggy when we awoke on Day 3, and since the last known forecast said we were likely to get rain that day, after breakfast we set up the bug shelter and put a tarp over top. This was a pretty large Serratus shelter (Made in Canada) that I'd gotten off kijiji but had not used yet other than to set it up a couple of weeks ago on the church lawn across from our house (there is no spot in our back yard big enough because of the way we have the plants configured). I paid $100 for it and it was in exceptionally good shape. Serratus is the brand which MEC eventually bought and turned into their house-brand products, though I think most of it is made in Vietnam now, sadly not in Canada. The shelter proved to provide a great retreat from the rain later in the day, as we spent the day just puttering around the campsite other than a couple of ventures out in the canoe to collect firewood from the other side of the lake, as well as to go fishing. 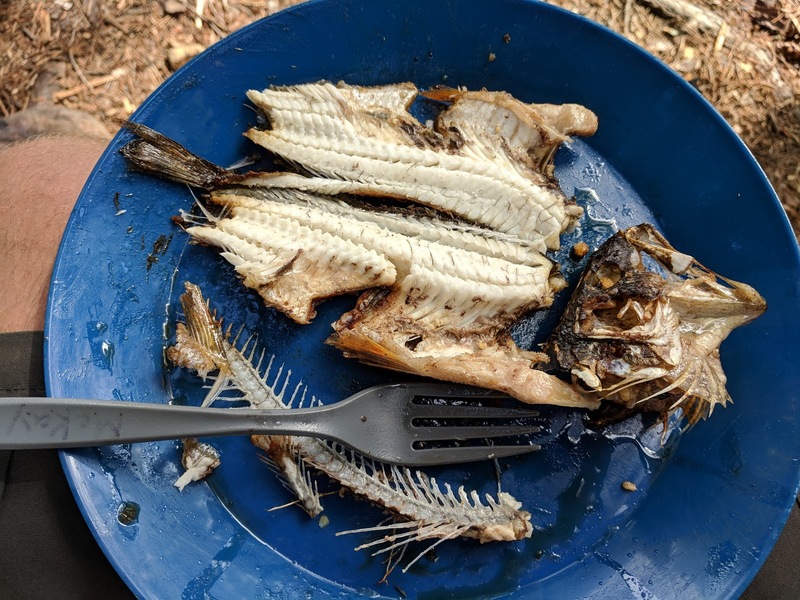 On our first fishing trip I got a couple of good sized perch that we kept and snacked on before supper - one got fried in butter and the other in bacon fat that we saved from breakfast. On our second fishing trip getting on into dusk our 8 year old caught his first ever fish - a half decent sized smallmouth bass that we released after getting a few pictures and a video. We still had half of our hamburgers left, and the system we used to keep them cold was working extremely well and they were still very cold well into day 3 - so that's what we ended up having for supper instead of the planned cous cous and indian food. We ended up having that as more of a bedlunch around 10pm just before packing it in for the night. Around 5am on Day 4 - Labour Day - we were awoken by a thunderstorm rolling through. It was pretty loud with some extremely heavy rain and a great light show for just over an hour, and I have to say that after being through a severe thunder storm with the Scouts back in July with winds strong enough to send several canoes airborn, I was pretty nervous. I did not blog about that incident yet here, but I did provide a writeup on our troop's blog which you can read here. And my wife recalling my recount of the Scouts trip was awake in her tent equally nervous. Fortunately for us it was just a thunderstorm and not a severe thunderstorm as they call them, and we were both able to get back to sleep for an hour or so. The 3 and 8 year olds in my tent did not wake up at all during this, but the toddler did, as did the teenagers in their hammocks. And half way through it I actually had to go to the bathroom really badly for #2 so I trudged through the woods in my bare feet, underwear and long sleeve polyester base layer and made my way to the thunderbox. Fortunately the tree cover kept me from getting completely soaked. 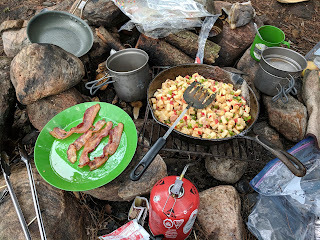 When we finally awoke on Day 4 the rain had stopped and we had a breakfast mainly of granola bars and other odds and ends that did not require cooking, and we started to slowly pack up our camp. Winds were coming and going and we were concerned about what the paddle out would be like especially once we got out onto Grand Lake which is a fairly large lake. 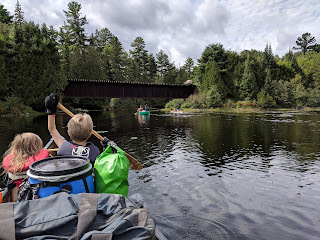 We did not manage to shove off until shortly after noon, and we decide to stay close to shore while we paddled up to the portage back into Grand. Once we got into the river the winds were blocked so things got calmer, but by the time we were through the portage and entering into Grand Lake we could see that the lake was not as friendly as we'd otherwise want it to be. We decided once again that instead of taking the short route through the middle of the lake we'd circumnavigate about 20 to 30 feet from shore. This probably doubled our total distance but it was definitely the safe thing to do. 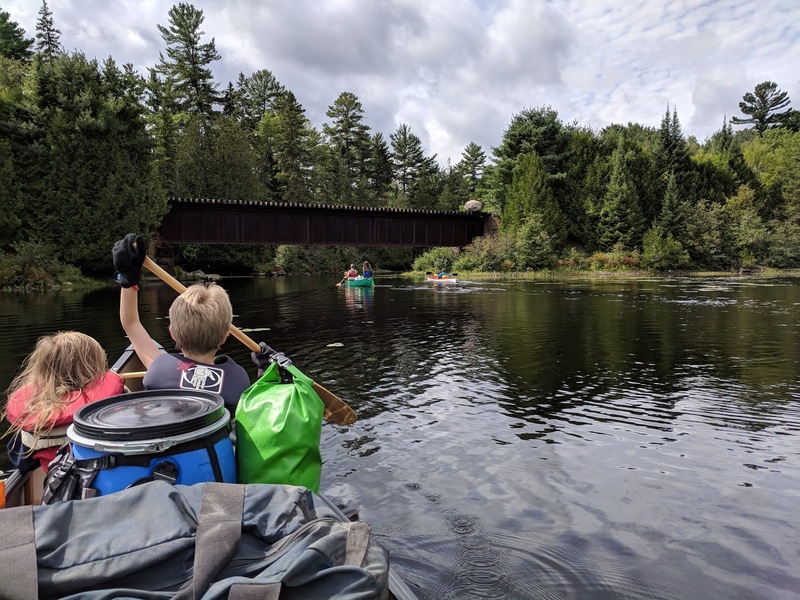 You can see one of the videos below to show what conditions were like - the two teenagers and I have definitely paddled in worse with Scouts, but these were not conditions that I was particularly thrilled about paddling in with my entire family including 3 young kids. Nonetheless we slowly made our way around the circumference of the lake with a short stop on the big sandy beach along the way, and around 3pm we were pulling into the launch area at Achray with no incidents to report. We were packed up and on our way in less than an hour, and headed back to Ottawa. 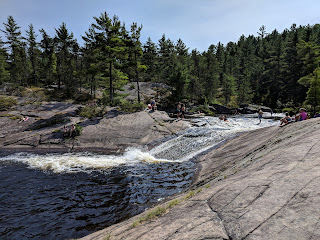 Everyone had a great time and we're really looking forward to another family trip, potentially back to the same spot since the waterslide at High Falls was such a big hit with everyone.